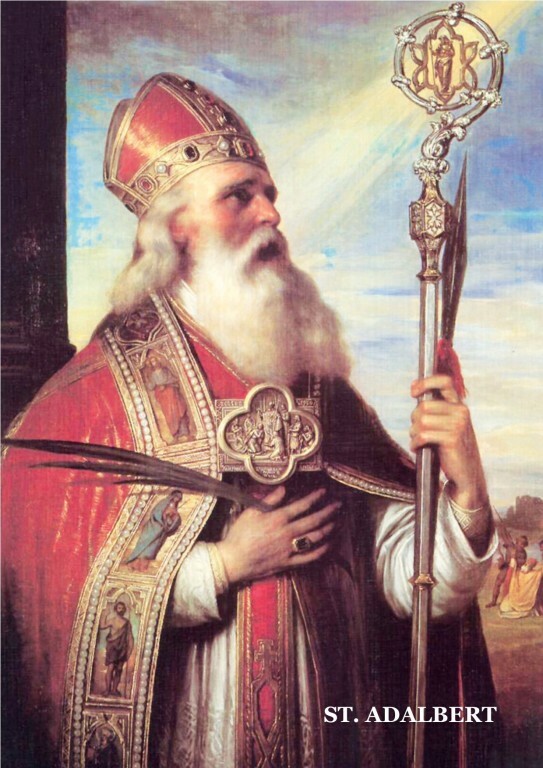 Saint Adalbert, our parish patron and guardian, we entrust you with our needs, our hard work, and our very souls. Through your intercession may we obtain the necessary grace to lead faithful lives, may we always be guided by love and a sense of justice, and may we always remain confident in God’s goodness and his love. Lead those who have gone astray back to the Church. Obtain penance for the weak and perseverance for those who love you. Protect and guide our married couples, our families, and our youth. Assist all parents in the raising of their children. Pray to God for our sick and suffering parishioners. Bless our parish. Awaken in us a faithful spirit and a love for Our Lady. Through your intercession, may we love our Church, live in accordance with the commandments, and may we achieve everlasting life. Amen. Father in Heaven, Creator of all and source of all goodness and love, please look kindly upon Saint Adalbert Parish and receive our heartfelt gratitude in this time of giving thanks. Thank you for all the graces and blessings you have so generously bestowed upon us, spiritual and temporal: our faith and religious heritage, our prosperity, our health, and the love we have for one another. Heavenly Father, in Your infinite generosity, we ask you to continue to shower Saint Adalbert with your abundant graces and blessings throughout the coming years. We ask this through Christ Our Lord. Amen. Lord of the Harvest, we petition you as you have instructed us to ask for more laborers to serve in the vineyard of Your Church. You have told us that the harvest is rich and laborers are few and we experience this great need in the face of the challenge of the New Evangelization. We ask the Holy Spirit to inspire young men and women to seriously consider vocations to the priesthood and religious life. Help all of us to be effective instruments to encourage and support those whom you are calling to serve and lead the Church of Brooklyn and Queens in the future. Lord, you told the Apostles to put out into the deep. We ask for the grace and courage to accept your call as we pray and work for an increase in vocations to the priesthood, diaconate and religious life. We ask this in the Name of Jesus Christ, the Great High Priest, Amen. Oh, Saint John Paul, from the window of heaven, grant us your blessing. Bless the church that you loved and served and guided, courageously leading it along the paths of the world in order to bring Jesus to everyone and everyone to Jesus. Bless the young, who were your great passion. Help them dream again, help them look up high again to find the light that illuminates the paths of life here on earth. May you bless families, bless each family. You warned of Satan's assault against this precious and indispensable divine spark that God lit on earth. Saint John Paul, with your prayer, may you protect the family and every life that blossoms from the family. Pray for the whole world, which is still marked by tensions, wars and injustice. You tackled war by invoking dialogue and planting the seeds of love: pray for us so that we may be tireless sowers of peace. O Saint John Paul, from heaven's window, where we see you next to Mary, send God's blessing down upon us all. Amen. Lord, You anointed Your Franciscan sons Michał and Zbigniew, with the gift of the priesthood. You sent them as messengers of the Good News and missionaries to the poor. You crowned them with the Palm of Martyrdom. Glorify them also with the Crown of the Saints. By their blood, shed for You, give us constancy in the Faith, protect our lives and grant us the gift of peace. Receive the innocent victims of violence into Your kingdom and grant them the Everlasting Prize. Amen. Saint Maximilian, amidst hate and imprisonment, you brought love into the lives of fellow captives and sowed the seeds of hope amidst despair. You bore witness to the whole world by word and deed that "love alone creates." Heavenly Father, You inflamed Saint Maximilian the friar and priest with love for the Immaculate Virgin, and filled him with zeal for souls and love of neighbor. Through his prayers, grant us to work strenuously for Your glory in the service of our sisters and brothers, and so be made conformable to Your Son until death. We ask this through Christ our Lord. Amen.